Travelling with your pet should be a fun experience for both of you. Dogs especially, love exploring new places and smelling all those wonderful new scents that they won’t find in their own neighborhood. Here are some tips for ensuring your pet is safe and comfortable on your next adventure. * Food and water bowls – although dogs love to explore they also like a little familiarity so take their regular bowls if you can. * Your dog’s favorite toy – this will provide a little comfort in new surroundings. * A blanket for your dog to sleep on – make sure it’s familiar to your dog before taking it on the trip. * A supply of fresh water – this keeps your pet hydrated especially on long trips. *Your dog’s vaccination certificates – these will most likely be required if you’re staying at pet-friendly accommodation. * Some small treats – to reward your dog for excellent travel behavior! * Your dog’s regular food – try to avoid making changes to your dog’s diet when away from home as this could cause tummy upsets. * Poop bags and a portable pooper scooper – to clean up after your dog wherever you go. * Any medications that your pet needs to take regularly. * An identity tag with your phone number on it and attached to your dog’s collar. Take your dog for a good long walk before you head off. A tired dog ensures that you will both have a relaxed trip. If you’re leaving very early in the morning and don’t have time for a walk beforehand make sure that your dog has had plenty of exercise the day before. You might even like to take your pet to the local dog park the afternoon before your trip so that he can expend some extra energy with ball games and a good romp around. Avoid feeding your dog just before the trip as some pets can get car sick. Carry some small treats with you instead that you can give your dog during the trip when you stop for breaks. You could also take some ice cubes as an alternative to water while you’re travelling. These will keep your pet hydrated without filling his bladder too quickly. Plus they will keep your dog busy too! Always ensure that your pet is secure in the back seat of the car. For larger dogs, a harness is a must. You can then attach the car’s seat belt so that your pet is nice and secure if you have to brake suddenly. It also stops your dog from escaping if you have to stop and accidentally leave the car door open to quickly get something out of the trunk. Trust me, this has happened and it’s no fun chasing your dog around unfamiliar streets in the middle of the night! If you have a small pet, then a soft dog carrier or crate may be a good alternative. 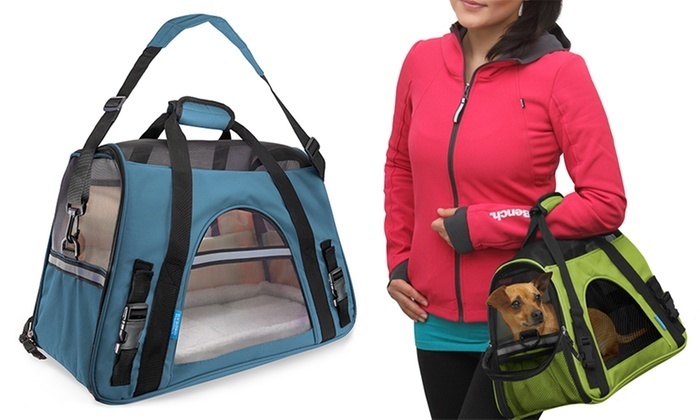 It will keep your dog snug and comfortable on long trips. Always ensure though, that your pet is familiar with the carrier before you head off on your trip. Familiarize your dog by having the crate in your home a few days before the trip so that your pet can get used to going in and out of it. You can put his favorite blanket in it as well as a much loved toy or a small treat. Make a game out of having your dog go into the crate and always stay calm and relaxed when ‘crate training’.Lastly, ensure that the crate or carrier is well secured while in the car. You may also like to invest in a hammock style car seat cover, especially of you have a large dog. This will not only protect your car seats but will make a nice, comfortable bed for your dog to sleep on while travelling. Then once you reach your destination, you can easily take the cover out of your car and use it as a blanket for your dog in the hotel room. Make sure that you take regular breaks on long car trips. This will enable your pet to stretch his legs and is also necessary for toilet stops. Find a nice scenic spot to stop at and take your best friend for a walk. Exploring the countryside together is a nice way to spend some time away from the car and makes the journey so much more enjoyable. You’ll also find that many towns and cities have dog friendly cafes with outdoor seating where you can enjoy a coffee and a snack while your dog will be provided with fresh water and maybe a pat or two from other patrons. Remember, travelling with your pet should be enjoyable so follow these tips and both of you will have a great time! These fundamental commands could be the base of connection between canine and human. The 2nd order that you need to train your dog is NO. This command needs uniformity from you, because the instructor, and every person in the household. The NO command need certainly to often be talked in a sharp guttural tone and alone. Don’t use together with your pets name, or in a panicked or high pitched tone that just comes normally if you were to walk in and see your dog chewing your favorite couple of shoes. Your tone must be authoritative sharp and powerful to relay your displeasure. Withhold interest as punishment. Uniformity is the key to coach your dog. STAY is still another command that every dog training should know. Building on SIT, stay beside your dog with the leash taunt, presented straight over his head. Integrate give signs and position your start hand in front of dog’s nose. State STAY and move in front of your dog to block his ahead movement. If he movements, replicate hand signal and STAY command. If he continues, shift back alongside him, produce him hold his STAY for a couple seconds, praise and treat. Just like each dog training strategy, continue to slowly raise batches of range and hold time with each training lesson. One more element when teaching your dog to STAY could be the three D’s. Duration, Distraction, and Distance. As I recently stated, it is essential to slowly raise the batches of Length and Range but Diversion should be introduced to check your pets knowledge of this command. Make sure to put diversion while teaching your dog before the exact distance gets also long. Frequent disruptions could be some body entering the training region with a toy, another dog walking by, etc. Teaching your dog to HEEL makes hikes in town a nice experience. I believe you’ve seen or skilled the dog owner that gets went by their dog. The dog owner is fearful of every nearing individual or pet because they’ve not been trained to HEEL. Your aim is that your dog will remain in your area on a walk. He won’t draw you or become too much to regulate with the disruptions of different pets or humans. Start from SIT, include’Let’s Go’therefore your dog knows what’s expected after he’s realized to HEEL. A good hint, workout your dog with enjoy before training to HEEL. Work out all excess energy and train your dog in a quiet diversion free area. Start at SIT, use your pets title and order HEEL. If your dog does not stick with you and darts out, change in another way and repeat command HEEL and dog’s name. Remember to generally to reward and address desired responses. The past fundamental order that is crucial while start to coach your dog is the order COME. That command seems really easy, all things considered all pets need to come to you, right? The problem with training your dog to COME is that owners do not utilize it usually enough in everyday interactions. Your dog will COME once you open the icebox door. The command needs to be reinforced by getting your dog in SIT and STAY, then by adjusting your local area, order COME, and use your dog’s name. Reward and incentive with each and every desired result. One very important point to consider is NEVER right or discipline your dog for responding to the COME command. Which Is Far better for Creating Your Small Business: Pinterest or Instagram? How Do Facebook Fanpages Work With regard to Your enterprise? © 2019 All Right Reserved By Sanantonio Hotels Advisor	| Clearex Theme by Xgenous.